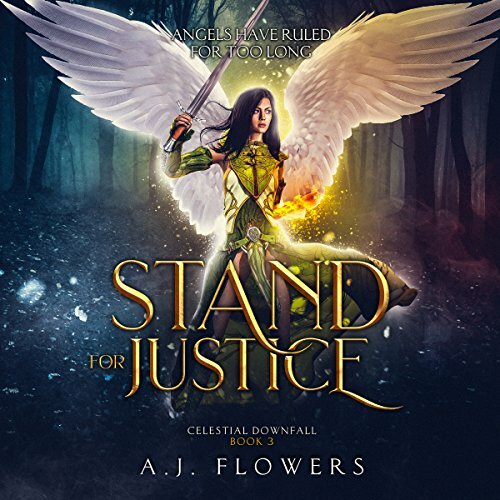 Stand for Justice is the jaw-dropping conclusion to the Celestial Downfall Trilogy. After executing a brave, if not foolhardy plan to usurp the Seraphim, Azrael's battle has only just begun. For the first time in history, humans, demons, and angels are working together. Her dream of a future where angelic slavery is abolished is within her grasp. But every deal comes with a price. Is Azrael ready to pay? Wow! Absolutely amazing! Such a glorious read that kept me entertained throughout this novel - a wonderful time spent listening to this novel. Simply brilliant writing. Fantastic world-building. Wonderful characters. I enjoyed myself immensely! Loved listening to it from beginning to end! The narrator was fantastic - she did an amazing job breathing life into this novel. This is a good book even though I had not read/listened to the first two. It was gripping. The book is very well written. The book definitely make you want to read/listen all in a row however I was hooked. I tried to filled in for the first two as I listened to this final installment. The book is a very good angels and demons book. If you like angels and demons this is the book for you. Everyone, humans, Angels and demons, has to work together to free the Angels. I will definitely gt the first two and read/listen this one again. You won't go wrong by purchasing this book. The author has done a great job of picking up where the previous book in the series left off. I thought this a good ending to the trilogy. The overall premise of angels and demons is interesting and unique. The narrator really brings these books to life and engages you. I would highly recommend reading/listening to these in order as you will definitely miss out on some of what is going on if you jump into the middle of the series. I think the series is definitely worth giving a try. This series is different than anything I have previously read. I would strongly encourage anyone to start with Fallen to Grace, book 1 in this series, so you can understand where the characters are coming from. This series is well written and there are quite a few twists to make it captivating. Narration was good and brought the characters to life. The story starts slow but once things pick up it is a fun adventure with suspense and unique developments. Azrael is a such a strong determined character and there are such great secondary characters that add to the experience. Together humans, Angels, and demons work to take the power away from the Seraphim and abolish slavery of Angels.